color science & "color theory"
Color and Culture: Practice and Meaning from Antiquity to Abstraction by John Gage  This is the perhaps the single most important work on color available from any publisher. Gage is concerned to trace the relationships in European and American art history between painting materials, painting "color theory," and larger cultural themes drawn from morality, aesthetics, science and commerce. If this sounds ambitious, Gage pulls it off with a detailed command of the evidence. The scholarly apparatus is impressive: small type endnotes that run in four columns per page over 30 pages, and a bibliography that fills another 20 pages. But the discussion of evidence is never pedantic, and he weaves his many themes into an intriguing and richly textured historical narrative. I almost believe there is no significant fact about the scientific study or artistic applications of color during the past three millennia that is not at least mentioned in Gage's survey. His overarching message is that color has been very difficult for artists and scientists to understand clearly. Gage brings in modern optical or psychological research on color only when necessary to address a specific color misconception or color myth. Instead, he develops his argument by revisiting of some of the major artistic controversies and color theories from the Middle Ages to the early 20th century: the claims for deseigno (composition, including drawing) versus colore (color); the "unweaving" of the rainbow into a natural color system; the evolution of scientific color research and color models; Christian and Romantic color symbolisms, Bauhaus color theories, and much more. Gage does not attempt to present the "truth" about color, or claim that modern color research is the pinnacle of historical progress. He prefers to show how "a failure to look at color comprehensively has led to absurdities of theory, if not of practice." His villains are artists and scientists whose abstractions or obedience to inherited ideas obliterated their common sense; his heroes are the empiricists and careful observers, the sober systematists of difficult facts. From this point of view all historical periods appear much the same  artists struggling under the influence of incomplete evidence, misleading theories, distracting technical problems, and distorting cultural or artistic beliefs. Much as psychoanalysis claims to dissect our symptoms so that we can see the futility of being neurotic, Gage dissects our many misconceptions about color so that we can see the futility of being dogmatic. It is a marvelously narrated and wide ranging introduction to the complexity of color. The major inconvenience in this approach is that Gage's broad themes often span centuries; as he moves from one theme to the next, the march of history is replayed from different perspectives. This scatters the material on any specific idea, artist or technique across different sections of the book, but the excellent index usually lets you find a specific comment. A somewhat shortened and revised version of this book was published in 1999 as Color and Meaning: Art, Science and Symbolism. This contains most of the same themes and major arguments, but occasionally presents new illustrations or corrects errors in the earlier book (1993), and in many cases organizes the content more usefully for artist readers. Finally, Gage has recently (2006) written Color in Art, which traces the implementation of various color effects or color ideas in painting styles from the middle ages through the 20th century. The Science of Art: Optical Themes in Western Art from Brunelleschi to Seurat by Martin Kemp  I had the experience of being flooded with light and clarity when I first opened and browsed this book. My enthusiasm is due in part to Kemp's extraordinary scholarship and detailed command of paintings and art publications across the entire span of western art. But it's also because his narrative of artistic imaging over the past six centuries is woven around the European romance with linear perspective, which has become so discredited and disliked by artists that it qualifies as a repressed memory. (Like any buried memory, perspective surfaces in the dreamlike digital animations of intergalactic science fiction and first person computer games, which take perspective effects to the ultimate level of technical accuracy and artistic triviality.) Kemp unearths those repressed perspective memories and shows how vital they were to the development of art and the connections between art and the wider culture of the times. It is jaw droppingly fun to see how intensive, sophisticated and singleminded was the artistic interest in optical and perceptual issues of seeing. Everyone will find special surprises here, but mine include Kemp's spatial reconstruction of the room portrayed in Velazquez's "Las Meninas", and the extraordinary drawings and engravings produced c.1800, which force us to realize that we are already looking at "photo graphs", light drawings created by hand at a time when film photography was not yet practical. There is a large section on various optical devices utilized in visual arts, including the camera obscura and the lesser known camera lucida, and an excellent section on the progressive understanding and use of color from the Renaissance to Seurat. Poignant for me was the Victorian fascination with light as a spiritual quality, which comes through in Turner's paintings and Ruskin's amazing perspectival studies of "clouds"  images that verge on op art. The intelligence and strength of these images reveal a road left untraveled in representation, which turned instead toward the perceptually analytical styles of Post Impressionism and Cubism. As a bonus to the many interesting visual exhibits, Kemp's exposition is consistently lucid, sensible and alert. An invaluable publication. Color Categories in Thought and Language edited by C.L. Hardin and Luisa Maffi  This is one of the most balanced and up to date overviews of modern color research available, an excellent introduction to some of the disciplines and major findings in the scientific study of color vision. The merit of this book is that it combines two distinct color research traditions: the cross cultural analysis of color words and their color referents in 110 different languages; and neurological or psychophysical studies of color perception in humans and primates. Researchers in each tradition have sometimes used results from the other to support their pet theories. Here the experts get together to summarize the latest findings in their own areas of expertise and critically examine how well their discoveries mesh with other research. Much of the discussion is focused on Ewald Hering's theory of the opponent processing of colors  the idea that red, yellow, green and blue, plus white and black, are psychologically basic colors. Current research has amply verified the importance of these basic hues in the encoding and processing of visual information by the eye and in subjective color judgments expressed in words. Unfortunately, the leap from perceived color to linguistic color categories remains a mystery. But the value of Hering's model is that it can bridge the retinal origins and linguistic end of color vision, which leads many researchers (even the skeptics included in this volume) to concede that Hering identified a fundamental structure in human color response. The linguistic studies innovated by Brent Berlin and Paul Kay in the 1960's (and extended by their graduate student Eleanor Heider Rosch in the 1970's) get a sympathetic overview; they are less controversial than they used to be, but they have also been more carefully restated and validated. There is now a general consensus that a restricted set of six basic color terms (the Hering unique hues, plus black and white) are sufficient to categorize all visible colors; that languages add more color names in a fairly consistent sequence (orange is always added before purple); and that tests of the efficiency of color perception (accuracy or reaction time in color naming or recall tasks) show that people around the world respond to similar "focal" colors (the Hering colors again) whether or not those are named as colors in the respondents' native language. The introductory chapter highlights the cultural variations in color naming without losing sight of the fundamental similarities in the colors being named. These topics motivate interesting chapters on the NCS color model and color terms in English and Russian. The skeptical chapters point to some empirical inconsistencies in the cognitive research: scaling studies suggest that yellow green/violet, and cherry red/teal blue, are the color "markers" of the opponent dimensions in perceptual color space, and that irregularities in the shape of this space may account for the focus on a few hues. The closing chapter integrates all the evidence to highlight some areas  the perceptual salience of the "warm" side of the color space in particular  that require further study. Readers of C.L. Hardin's Color for Philosophers: Unweaving the Rainbow (Hackett, 1988) will recognize his straightforward writing style and careful evaluation of facts in the crisp editing of this book. Research methods and key findings are presented clearly, without technical jargon; graphs and tables are used sparingly, and incidentals or details are usually kept to a minimum. The New Munsell Student Color Set by Joy Turner Luke  If you are a beginning artist, an aspiring designer or just someone fascinated with color, then this is a great publication to train yourself in the many nuances of color vision. The format is a 8"x10" black, three ring binder of 13 white card pages, and 13 small plastic baggies of dull finish color chips, somewhat smaller than postage stamps. Each page presents an empty grid of color (light to dark down the page, and dull to brilliant across it) that you must fill in manually by placing each chip in its assigned position. There are no codes or color names printed on the back of the color chips to help you along, but there is an introductory page explaining the basic concepts of hue, chroma (saturation) and value  the three basic attributes of color. Accompanying the binder is a staple bound color primer by Joy Turner Luke. Although the production values are modest, this is one of the best overviews of color I have read anywhere, and it's addressed primarily to artists and designers. Luke gets into the history of color research, the basics of color vision, the details of color mixing (she has a skeptical view of the many commerical "artist's color wheels" on the market today), color design and more. The color chips are fussy to work with; they are delivered unattached to the card pages so that you can sort and rearrange them in various color tests or color demonstrations, but the real point is that you must arrange them on their color pages using your eye alone. At first, it's easy to get them mixed up, but with practice you become much more sensitive to the nuances of hue, value and saturation. Once I'd learned what I could by that method, I found it convenient just to glue them in place, so they wouldn't get lost and were ready for quick reference. Although the size and number of the paper color chips will make this book unsuitable for most elementary school children, it is a very instructive introductory resource for young adults and a useful color reference for artists of any age. Interaction of Color by Josef Albers  There is a great number of 20th century "color theory" books on the market, and I have waited to make a recommendation until I understood color well enough to interpret what they have to offer. Johannes Itten (1888-1967) and Faber Birren are the best known authors in this peculiar "color theory" literature, although Itten was considered a fatuous crank by his more talented Bauhaus colleagues Paul Klee and Wassily Kandinsky, and Birren published much but said little that was innovative or insightful about color. Compared to them, Josef Albers (1888-1976) strikes me as far more artistically adventurous, intellectually honest, and perceptually involved. He does not say he understands how color works. Instead he compiles a long series of exercises or projects, all of them using colored paper rather than paints, as the method for artists to learn how to see and appreciate color relationships. The "color theorists" talk about color rather than experiment with color  exactly what Albers wants to avoid. What's remarkable about these color theorists is that they are oblivious to the hazards of talk. Many of their concepts won't stand up to empirical investigation, or are too vague even to test. They discuss color effects that are primarily driven by value rather than hue, but do not grasp or explore the impact of value as the dominant factor in visual perception. As a result, the names Itten or Birren almost never appear in the citations or indexes of thoughtful, factually grounded books on color. Albers' book is different. He asks you to undertake your own series of color projects, he invites you to investigate personally how different color effects occur, and in its original edition the color effects were illustrated by . (Some of these color constructions are adapted from Chevreul's Principles of Color Harmony and Contrast or from J.W. Goethe's Chromatics.) The book reads like a teacher's manual for classroom use, but Albers has a more individualized ambition: to teach you how to teach yourself to see color. And teaching you how to teach yourself, rather than how to learn from someone else  that is to me the mark of a true master. In 1999 I wrote that the currently available paperback edition of Albers's book omitted a large number of the original demonstration color plates. A new "revised and expanded" edition was published in 2006 with 34 color plates selected from the 80 silkscreen color folios of the original (1963) edition. The omitted examples hardly detract from the wonderfully exploratory spirit of the book. Theory of Colours by Johann Wolfgang von Goethe  This is without a doubt one of the oddest "color theory" books available. The German writer and bureaucrat Johann Wolfgang von Goethe (pronounced "GUR-ta", 1749-1832), most famous for his poem Faust and novel Sorrows of Young Werther, spent almost two decades of his maturity developing this remarkable meditation on color  a compendium of personal speculation, anecdotes gleaned artist acquaintances, informal naturalist observations, homebaked demonstrations with prisms, colored papers and staged lighting  all published in 1810 as Zur Farbenlehre ("On Chromatics"). Because this text was (and still is!) often commended to artists for entirely specious reasons, I present here a careful and lengthy review. This English translation (the only one available today) was published in 1840 by the Victorian art historian Charles Eastlake. It highlights the oddly divided agenda of Goethe's project. The original German text begins with an extensive collection of "didactic" color observations and conjectures (also titled Zur Farbenlehre), followed by a "polemical" screed against Isaac Newton's Opticks which Goethe called an "old nest of rats and owls" (Unmasking Newton's Theory), and concluding with a review of previous color theories, which include yet more attacks on Newton's methods and character (Historical Part). 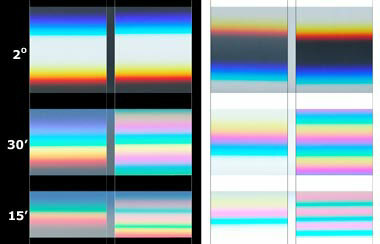 An appendix on the entoptic colors visible in polarized light was added in 1820. Significantly (and regrettably), only the "didactic" color observations appear in Eastlake's translation. In his preface, Eastlake explains that he deleted the historical and entoptic parts of the book because they "lacked scientific interest", and censored Goethe's polemic because the "violence of his objections" against Newton's color theory would prevent readers from fairly judging Goethe's color observations. Let's start with the "violence" heaped on Newton. This flowed from Goethe's conclusion that the Opticks (1704) contained both factual and moral errors; by his critique of these errors Goethe leads us into the world view that underlies his color observations. Newton empirically refuted the belief, inherited from classical naturalists and medieval optics, that the sun's "white" light was pure, homogeneous and fundamental (or "primitive"). Using prismatic refraction of a single shaft of sunlight, he showed that "white" light actually contains at least seven hues, which could be reassembled to form "white" light again but whose individual colors were otherwise unchanged by manipulation with lenses or filters. These various hues were, therefore, equally "primary" or irreducible colors. In reply, Goethe reasserted the theory commonly attributed to Aristotle and inherited from medieval optics that color results when light comingles with dark. He lists as the basic tenets of this position (Unmasking Newton's Theory: Instead of An Epilogue) that "white" light is simple and homogenous (he calls sunlight the "Urlicht" or original light); that colors are caused by the "shadowing" or darkening of homogeneous light; that it was therefore absurd to conclude that light could be reassembled from darkness; and that there are not seven but only two "primary" colors  yellow and blue  that emerge first from the light and dark mixture. These points comprise what I'll the factual disagreement with Newton. I describe below the evidence Goethe used to illustrate this supposed error. Here it is worth noting the historical context. The Aristotelian dogma was still defended by influential artists and naturalists at the turn of the 19th century. The German Neoclassical painter Anton Raffael Mengs (1728-1779) had been a vigorous advocate, and many of the Neoclassical artists whom Goethe consulted in the 1790's (such as Heinrich Meyer and Angelika Kauffmann) accepted the Aristotelian light/dark framework as well. It was defended by the 18th century French academics that Goethe praised in his historical review, and even by some 19th century British scientists. This is the basis for Goethe's baffling optimism (e.g., ¶173, ¶727) that his book would rally contemporary scientists to find empirical and mathematical support for the Aristotelian dogma. However, by 1840 the Newtonian theory was far more widely accepted, which made Goethe's harsh assault against it appear especially disappointing. I should point out that the ancient theory is metaphorically correct! Color really is created by the partial "darkening" of "white" light by matter. But the mechanism of this darkening was precisely described by Newton as "nothing but a Disposition to reflect [or absorb] this or that sort of Rays more copiously than the rest". Colors result because some of "primary" colors of light are absorbed or darkened more than others; the purest (most saturated) hues appear when the "white" light spectrum is pared down to a single homogenous color band of the spectrum, producing colors that are also dimmer (darker) than the original "white" light. The Aristotelian theory was by contrast not specific about the mixture process that allowed just two primitives to produce all colors (diagram, below), and it was this problem that primarily attracted Goethe's attention. Although Newton only provided a physical explanation for the stimulus, he was careful to point out that the stimulus is perceived as color only through attributes of mind: "The Rays to speak properly are not coloured. ... [Colours] in the Rays ... are nothing but their Dispositions to propagate this or that motion into the Sensorium; and in the Sensorium they are Sensations of those Motions under the Forms of Colours." Thus, Newton was first to make the important distinction between the physical aspect of color (its angle of refraction, or refrangibility, when passed through a transparent medium) and the sensory phenomenon of color (a response to refrangibility by the perceiving mind). In contrast, the Aristotelian theory typically claimed that color is created by material substances, which forced its advocates to define prismatic or rainbow colors as "illusory" or "false" colors. Here Goethe is not just saying that Newton carelessly got a few facts wrong: he accuses Newton of systematically ignoring perceptual facts entirely in favor of abstractions and concepts that we can only imagine or talk about. Thus, Goethe avoids any reference to optics or light "rays", as these concepts drag in the abstract scaffolding of mathematics and physics that he called "a scientific coffin". This is what I call his moral disagreement with Newton, and it motivates Goethe's indignant, ad hominem polemic. In the section titled "Newton's personality" in the Historical Part, Goethe describes Newton as a man "without passion, without longings", whose organ of perception was mathematics and who therefore experienced geometrical ideas as tangible reality. (In the deleted polemic, he compared Newton and his abstractions to a child who looks behind a mirror, expecting to find the reflected objects there.) In effect, Newton's abstract thinking is interpreted by Goethe as a kind of perceptual delusion. His "rigid character" hastily seized on the wrong phenomena, or illusory perceptions, and then methodically built a theory around them by ignoring inconvenient facts or denying their implications. "We can compare the Newtonian method to a stage set painted in perspective, which must be seen from only one viewpoint to make the lines convergent and convincing. Newton and his disciples do not want the viewer to step a little to one side and view the scene as a whole" (Unmasking Newton's Theory, ¶74). However Newton is for Goethe (as he was for most of Europe) the chief symbol of the kind of science that had become dominant by the end of the 18th century. By attacking Newton, Goethe was attacking modern science more generally, primarily in order to defend a very different world view and a very different approach to natural phenomena. Newton's Philosophiae Naturalis Principia Mathematica ("The Mathematical Principles of Natural Philosophy", 1687), is perhaps the greatest work of the Scientific Revolution and a cornerstone of modern physics. The essential premise of the book is that diverse natural phenomena can be explained as the action of a fundamental natural property acting within a universal mathematical regularity. To do this, the natural property must be inductively identified through careful observation and then its reach and effects deduced through geometrical proofs and the mathematical analysis of data. Newton illustrated this approach by analyzing the motion of celestial bodies such as planets and comets and of material bodies such as pendulums and fluids. This paved the way for advances in physics, astronomy and engineering across the 18th century that culminated in the Industrial Revolution. This approach is exemplified in the watercolor Color Magnet (right), painted after a long evening discussion with the poet Friedrich Schiller about the "polarity" of color (explained below). That is: if color has polarity, and magnets have polarity, then perhaps there is a phenomenal "attractiveness" in both materials and in colors. The short vertical bars (far right) represent primordial yellow and blue refraction fringes (also explained below) that Goethe considered to be the basic phenomena; the curved bars (at left, which are drawn to resemble the curve of iron filings across the opposing poles of two magnets), show the mixtures that result when "attracting" fringes are overlapped to produce the "union" mixture green (below) and the "deepening" extraspectral mixture purpur (above). These combinations in turn create Newton's spectrum (horizontal bar, center bottom) and the extraspectral purples (horizontal bar, center top). Linking all mixtures together end to end, just as several bar magnets can be linked together in a row, produces the central vertical bar, the circumference of the hue circle. There is an almost mystical simplemindedness in this pursuit of patterns, resemblances and associations, but it is the essence of the Goethean approach to natural phenomena. Unfortunately, Goethe's antagonism to abstract theories has been obscured by the English translation title: Farbenlehre simply means "chromatics," with no "theory" implied (just as Sprachlehre means "grammar" and not "theory of speech"). And given Goethe's deep sensitivity to language, it is not irrelevant to note that the root meaning of lehre is "lesson," "teaching" or "learning from experience". In the same way that a grammar of language simply describes the patterns in how we speak, Goethe wanted to develop a holistic "grammar" of color that describes the patterns in how color appears. He was seeking the patterns in color experience  not a theory of colors extracted from physical experiments. This makes his book an important precursor to German phenomenology. All these complexities have disappeared from the truncated English version of the book.  (2) the many objective color effects that seem to have nothing to do with a prism  diffraction, interference, iridescence, opalescence and color changes in translucent or chemically transformed materials. The subjective color effects are used to show that the eye can create colors on its own, in the pattern of complementary contrasts defined by a color wheel, which Goethe calls the "colorific circle" (described below). Perhaps the most striking example of an afterimage occurred when Goethe, Germany's most celebrated womanizer, stared too long at a comely serving wench who was standing in bright light (¶52-¶53 of Theory of Colours). 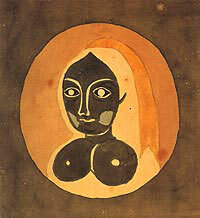 In the afterimage that appeared when he looked at a dark wall, he saw her emerald bodice turn scarlet, her black hair become luminous, and her pale skin turn dark (Goethe's faded watercolor, right). Though amusing, the anecdote illustrates Goethe's method of identifying analogous patterns or phenomena in different domains  here, in both the physical world and in the eye. This analysis of beautiful women and "eye animism" sharpens the point to Goethe claim that Newton lacked passion or desire, and preferred geometry and mathematics to sensual life. For Goethe the young woman is the reality, not geometry, and his visual response to her, in the afterimage created by his arousal, was part of the "primordial" desire and longing that animates every aspect of the world. In his "subjective" examples, Goethe is basically weaving a poetic gloss around phenomena that were already well known to naturalists of the time. When he attempts an explanation for the physical or "objective" causes of color, things get murkier.  the "doubling" of images observed in the penumbra of shadows cast by the sun or by laminated materials (such as the front and back of a mirror or a sheet of colored glass, or in mica and soap bubbles). Goethe uses all these phenomena as analogical evidence for "the doctrine of semitransparent mediums and double images" (¶299, ¶691): color is always associated with some kind of clouding (darkening) or displacement of an image. He puts special emphasis on the colors produced by semitransparent media, both atmospheric and physical (¶145¶175), as the "primordial and elementary phenomenon" (¶174). These provided the most obvious clues as to exactly how light and dark mixed to make color. A key example (described by Aristotle and Leonardo da Vinci) appears in the changing appearance of smoke, which is bluish when seen in front of a dark background and reddish when seen against light (¶160). These contrasting effects seem to demonstrate that the light/dark polarity acts spatially  depending on whether dark is located in front of or behind the light. Considered from a general point of view, colour is determined towards one of two sides. It thus presents a contrast which we call a polarity, and which we may fitly designate by the expressions plus and minus. Note that Goethe first labels the polarity abstractly, with arithmetical signs, then assigns to it a remarkable range of sensory, emotional and physical correlates that resemble the artists' warm/cool contrast but go much farther (into alkalis and acids). This gives the contrast a metaphoric quality that I signal by writing the color labels in capital letters. In keeping with the smoke effects described above, Goethe assigns a spatial relationship to this polarity. The color variations in the YELLOW (+) pole, which include all hues from pale yellow into deep red, are created by overlaying increasing amounts of dark on or in front of light; the colors in the BLUE () pole, which include violet to pale blue, are produced by overlaying increasing amounts of light on or in front of dark (¶145¶151). Next, by placing a narrow white band of paper on a black background, as viewed through a prism, Goethe shows that the opposing YELLOW/BLUE yellow and cyan fringes mix in the center to create green (¶214)  the "union" of the YELLOW/BLUE visual polarity. And placing a black band of paper over a white background, the fringe positions are reversed, overlapping violet and red to produce a "deepening", "intensification" or "augmentation" of the BLUE/YELLOW contrast as "purpur" ("a red that contains no part of yellow or blue", cf. ¶215 and diagrams below). These two mixtures complete the hue circle. Goethe is not explicit about what his terms union or augmentation mean, perceptually or physically, or even whether they operate in the eye or in the materials affecting the light, or both: they are simply alternate forms of color fusion. He does frequently refer to purpur as the acme or purest state of color, yet he explicitly does not elevate the purpur/green contrast to a polarity equivalent to YELLOW/BLUE. This is puzzling, given that most of the subjective color changes observed in afterimages or in chromatic induction (simultaneous contrast, successive contrast and colored shadows) produce contrasts between red and green, not between yellow and blue. As noted in the deleted "Historical Part" of Theory of Colours, these pretty, yellow and blue prism fringes had been described by the Jesuit Cartesian Louis Bertrand Castel in 1740, and were of course familiar as the chromatic aberration recognized as a problem in the manufacture of optical instruments since the 16th century. Castel had used these fringes polemically (and in a sarcastic and "violent" tone very similar to Goethe's) to show that Newton had been distracted by a mere "ghostly magic". Goethe's innovation was to add the complementary "dark" spectrum  which appears in the fringes at the shadow edges of a bar or pencil placed across the beam of light before it is refracted by the prism  to demonstrate the origin of the "dyer's primaries" yellow, blue and purpur that describe subtractive (dye and pigment) mixtures. 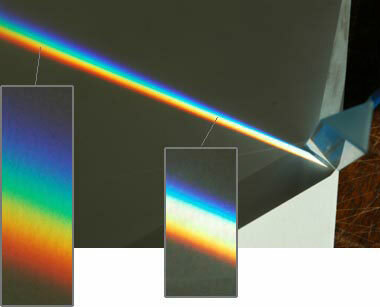 In either version, Goethe (like Castel) pointed out that the edge fringes appear in the refracted beam just after it emerges from the prism and much before the complete spectrum is visible (photo, above). And while the YELLOW/BLUE fringes appear along any contrasted edge viewed through a prism, the spectral colors only appear when the edges form a band that is visually narrow. As a parlor trick and as a schematic (diagram, below), this simple demonstration was one of the most persistent arguments used against the Newtonian theory of multiple "primary" colors by all 18th and 19th century defenders of the ancient light/dark theory. It was persuasive to many intelligent people for over a century after Newton published the Opticks. And it was the primary evidence Goethe offers to prove that Newton's spectrum is only a "secondary" phenomenon, because it only appears after the primordial cause (the YELLOW/BLUE edge fringes). Note, however, that there is an unexplained inconsistency (marked by ?, above) when the fringes overlap so far that violet mixes with yellow. This produces a yellow mixture in the "dark" spectrum but violet color in the "light" spectrum. Since YELLOW is produced by dark over light, and BLUE by light over dark, this color ambiguously results from a double layer of light (or dark) sandwiched between two layers of dark (or light)! Goethe explicitly left these areas colored gray when the diagrams were first printed as Plate 5 and Plate 6 of his Beiträge zur Optick ("Essays on Optics") in 1792, so he was at first aware of this inconsistency  then later suppressed it. Newton's explanation for these fringes, which combines additive mixture with the differing "refrangibilities" of different spectral hues, is carefully laid out in the Opticks (Book I, Part II, Proposition viii), a passage that Newton's critics either did not read, could not understand or chose to ignore. The explanation consists of two parts: the additive mixture of light, and the differing angles of refraction of the spectral hues. Additive mixture is easier to grasp if you start with the demonstration of additive mixtures produced by overlapping or converging beams of monochromatic or "pure color" lights (diagram, right). Where "red" and "green" light overlap, they produce yellow; where these overlap with "blue" light, they produce white. In the prism example, think of the different hues of the spectrum as six diverging beams of colored light, all shining through the same aperture, which represents the prism, but each angled away from the others to mimic the fanning out of hues that appears in a prism spectrum (diagram, below). Additive mixtures always brighten as more light is added, but they also become more desaturated (paler or whiter) as the mixed hues are more dissimilar. So closer to the prism, where more and more of the colored beams overlap, we find paler, brighter additive light mixtures: this creates the central beam of "white" light. However, as the diagram shows, the "red" and "violet" wavelengths emerge first from this overlap with the other monochromatic beams. This is why Goethe's YELLOW/BLUE fringes (in their darkest "red" and "violet" hues) appear first. The beam of pure "green" light near the prism is completely whitened by the combination of "red" and "violet" light, and farther from the prism it mixes with "blue" to make "cyan", and with "orange" to make "yellow". So as we move farther from the prism the "green" light is either effaced in a "white" mixture or adds to the "blue" and "yellow" fringes, creating fringes that are now "violet+blue" and "yellow+red" but still divided by a narrowing band of white. In his Plate IV, Goethe portrays these mixtures in their "objective" form, as the physical distance of the image from the prism in relation to the width of the light beam. He repeats the demonstration in a "subjective" form, as the visual width (angular size) of black/white bands viewed through the prism. These demonstrations are summarized in the images below (and the original photos are posted here.) The "primordial" fringes are produced by a white or black bands viewed against a contrasting background, and at a visual size below 1° they merge to form the light spectrum (green center) or dark spectrum (magenta center) at a visual width of about 30 minutes of an arc. Photographs of (left) white bars on black background and (right) black bars on white background; bars viewed at an angular size of 2° (top row), 30 arcminutes or 1/2° (middle row) and 15 arcminutes (bottom row). Each image shows a single bar against the background (left column) and alternating white/black bars of equal width (right column). Colors desaturated due to image flare. If we compare these images to Goethe's Plate IV, we discover yet another inaccuracy: at the smallest visual frequency (15'), which appears only at a viewing distance of 10 meters or so, the alternating black and white pattern degrades into alternating orange/green or magenta/green bars of equal width. These are the "red" and "green" colors that Goethe repeatedly observes in diffraction or interference effects (his catoptrical colors and paroptical colors). However the geometry explicit in Plate IV requires that the "yellow" or "violet" part of the spectrum must continue to expand relative to the total width of the refracted light beam at greater distances. Goethe did not step far enough back to view the green/magenta effect of higher spatial frequencies, and he did not read the later sections of the Opticks where Newton attributes these interference colors to the "spacing of fits" (differing wavelengths) of specific spectral hues. Goethe did not report these effects, so he did not have to explain them. Thus, in Goethe's key counterexample against Newton, we find two demonstrations of his slipshod approach to color research, or perhaps to overlook evidence against his theory. And these can stand for the dozens of superficial and even hilarious errors, conjectures and outright fabrications that appear when Goethe attempts to link color to physical phenomena. He confuses afterimages with Gegenschein or with electrical discharges from a kite (which mariners knew as "St. Elmo's fire"; ¶30), confuses shadow parallax with diffraction or refraction (¶366-428), confuses image flare with retinal undulations (¶98). His "double image" explanation of refraction effects is both feeble and inconclusive (¶218-¶242), and his discussion of the "augmentation", "culmination" and "fluctuation" of colors is merely incomprehensible. He claims that "the yellow and yellow red affect the acids, the blue and blue red the alkalis" (¶492) though these color relationships are not at all chemically consistent; and that "metals, when slightly oxidated, at first appear white" (¶497), omitting that iron oxidizes directly into red, silver into black and copper into either red or black  or, as Goethe claims, into blue (¶515). He asserts that the image of the sun passed through a square aperture nevertheless appears round because "we might rather consider the splendour of the sun, or any light, as an infinite specular multiplication of the circumscribed luminous image" (¶402). His few genuinely insightful or interesting color observations are buried under a tedious heap of mythical, uninformed or impressionistic color anecdotes  about the view of the moon from a balloon, the color effects of opals, or the blue light emitted by rotting wood. There are dozens of paragraphs (¶758¶832) on the "moral" (psychological) effect of colors (scarlet is especially pleasing to "impetuous, robust, uneducated men"; vivid colors are especially attractive to children and savages). He offers the sky as an example of how blue is produced by light over dark (sunlight over space), but does not address the obvious counterexamples of medieval blue stained glass, or blue ice, which are produced by light shining through (from behind) the darkened material. Indeed, the claim for Goethe's color authority seems to hang on a single icon  the Farbenkreis or "colorific circle" (¶50 and Plate I, Figure 3 of Theory of Colours; diagram, right). Much of the justification for the color circle comes from complementary afterimage and shadow colors (¶39-¶80). Yet, as both John Gage and Martin Kemp point out, complementary color phenomena had been independently described several times by 18th century naturalists such as Comte de Buffon, Ignaz Schiffermüller, Moses Harris, George Palmer and Count Rumford in the 60 years before Goethe began his own color explorations. And it is ironic that all circular arrangements of hues, including Goethe's, are based on Newton's original hue circle. Much of this literature Goethe knew when he published his first essays on color in 1792, but his polemical inspirations (from Castel in particular) and his borrowings from 18th century naturalists have been lost with the deleted "Historical Part". Instead, Goethe is today habitually given priority for the traditional (and inaccurate) three complementary contrasts of yellow/violet, orange/blue and red/green (cf. ¶60, ¶612, ¶810). Even here, Goethe is misread by his modern advocates. His gelbrote ("yellow red") does not mean "orange" but red  that is, "yellowish red" or scarlet. Goethe says this color can produce "an intolerably powerful impression" that he equates with spectral "red" refraction fringes and with the pigments vermilion and minium (red lead oxide, cf. ¶774-¶775). And his term purpur (inconsistently rendered "red", "pure red" or "bright red" in the translation) does not mean a spectral "red" but what we would today call magenta or red violet, because Goethe specifically equates it with the brilliant hue of a Roman cardinal's carmine dyed robes, the color extracted from the shellfish dye murex, and the color produced by overlapping opposite ends of the spectrum (cf. ¶215, ¶704 and Goethe's Plate IV, above). The crux here is the very different outcomes from the very similar researches and speculations of these two men. Runge rejected the Aristotelian theory, made splendid use of complementary colors and optical color mixing in his own paintings, and used his color sphere to define pleasing or discordant complementary color combinations  exactly as Michel-Eugène Chevreul would do with his color hemisphere almost 30 years later. In contrast, as Eastlake writes in his preface, "in the portion expressly devoted to the aesthetic application of the doctrine, the author [Goethe] seems to have made but an inadequate use of his own principles". Even when charitably summarized, Goethe's theory of color is incomplete and inconsistent. Worse, Goethe is guilty of the very faults he attributed to Newton. He interprets only certain observations in a certain way, confuses cause and effect, and omits or misinterprets conflicting evidence in pursuit of his tendentious and erroneous preconceptions. As Goethe himself proudly declares, "my draft color theory is inherently polemical" (Unmasking Newton's Theory, ¶1). What explains Goethe's willful and antagonistic obsession with color? His English biographer Nicholas Boyle explains that throughout the 1790's Goethe was struggling through what we would today call a midlife crisis  grief over lost youth in Italy, the limitations of domesticity, boredom in his daily bureaucratic responsibilities, anguish at the violence of the French Revolution and Napoleonic tyranny, and revulsion toward the spiritually empty world view that Rationalist science seemed to advocate and industrial practice was beginning to make real. Boyle explains that Goethe's subjective approach allowed him to project his personal conflicts into his study of color and his horror of abstract science onto Newton; his Farbenlehre was to be a liberating and life enhancing new "poetry of the spirit". This emotional turmoil infused his emphasis on color "antagonisms" and color symbolism (another area where Runge and Neoclassical artists led the way), ideas which heavily influenced 19th century German philosophers such as Georg Friedrich Hegel and Arthur Schopenhauer. Yet the early 19th century scientists who reviewed Goethe's book almost unanimously dismissed it as the result of his peculiar methods  the English naturalist Thomas Young called it "a striking example of the perversion of the human faculties," and a Continental reviewer summarized it as "a tissue of ingenious and obstinate error". It has been fashionable, ever since Eastlake published his amputated translation, to wave away Goethe's light/dark theory, naive prism demonstrations and gibberish physical color explanations in order to better appreciate his "sensitive" color observations. The subjective color contrasts which Goethe borrowed from the 18th century scientific literature remain well established facts of color vision, and these also are brought to Goethe's defense. True, goes this argument, Newton's physical account of color was integrated with the perceptual trichromatic theory of color vision as a highly successful explanation of retinal color sensations and of all the physical ways that color is produced by an external light or material stimulus. But many subjective color effects can only be explained in terms of the color psychology imposed on the retinal sensations, and cannot be predicted from the light stimulus alone, and this position is often attributed to Goethe, even though he expressly states that the eye simply mimics the dynamic principles found in the external world. Goethe is even said to be vindicated in the two color contrasts  yellow/blue and red/green  that inform Evald Hering's theory of unique hues and that are fundamental to most modern models of color perception. I strongly reject this view, because it is based on a biased interpretation of a mutilated edition of the book Goethe wrote, and because it credits Goethe for color observations painstakingly developed by his predecessors or successors. I can think of no other case, on any topic in any literature, where posthumous reputation is premised on blatant censorship and misattribution. But there is a more important issue. When Goethe's book is read as a whole, the intellectual "debate" between Newtonian color science and Goethean color poetry remarkably foreshadows the contest between evolution and Creationism (aka "Intelligent Design")  and with uncanny parallels in the details. The same rhetorical tactics used today by Creationists against evolutionary biology (ignoring or misconstruing evidence, selective citation, reasoning from false premises, fabricating explanations to suit preconceptions, "what if" counterarguments, and hostile ad hominem rhetoric) were used by the Cartesians and by Goethe against Newtonian physics. The same spiritual accusations made today by the Creationists against evolution or cosmology more generally (that it is imaginary, that it is "only a theory", that it is soulless, that it ignores the evidence of our senses, that we can't actually "see it" happen) were made by Castel and Goethe against Newton's "ghostly" refrangibilities. This antirationalist rejection of the scientific project, which fundamentally comes down to the feeling that there is more to life than science can explain and that there is something sinister in the direction that science is taking humanity, is an extraordinarily enduring divide in modern intellectual history. Indeed, since Goethe's era it has only widened into the "two cultures" described by Sir Charles Snow in 1959 and played out in the "culture wars" of politics today. Goethe observed that it takes a great man to exemplify a great error. An informed, uncensored study of Goethe and his place in the scientific debate of his times might help us better understand the origins of this fascinating cultural dislocation. In sum, this book about color by a man who was neither an artist nor a scientist offers neither practical artistic guidance nor a valid scientific approach to color. It offers instead a fascinating case study of error and falsehood. Oblivious to the grossly censored and misinterpreted transmission of Goethe's true gospel, many authors today still treat him as the quotable old testament of "color theory" in what has become a ritual display of color erudition. As I've taken pains to show, ritual is never erudition enough. The complete German text of Zur Farbenlehre (useful to evaluate Eastlake's translation), along with many of Goethe's earlier writings on color, are available at the Farben-Welten web site. The remarkably negative Continental reaction to Newton's empirical rather than "theoretical" approach to science, due primarily to his refutation of the physical theories of both Aristotle and René Descartes, is nicely summarized in The Newtonian Moment: Isaac Newton and the Making of Modern Culture by Mordechai Feingold (New York Public Library: 2004). For a sympathetic if fuzzy minded reading of Goethe's project contra Newton, see Goethe Contra Newton by Dennis Sepper (Cambridge University Press, 2003). Kevin Brown's Zur Farbenlehre is a careful and thoughtful exploration of the many (and sometimes ironic) similarities and contrasts between Newton's and Goethe's approaches to color. The Principles of Harmony and Contrast of Colors by Michel-Eugène Chevreul  This classic "color theory" text, published in 1839 as The Law of Simultaneous Color Contrast (translated into English in 1854), is an artistic milestone, one of the first systematic studies of color perception and a compendium of color design principles that many 19th century French painters from Delacroix to Matisse attempted to apply in their art. After an illustrious academic career studying fats and waxes, the chemist Michel-Eugène Chevreul (1786-1889) was appointed by royal decree to be director of dyes at the national Gobelins textile factory in Paris, where he worked for 28 years (1824-52) on chemical research and quality assurance in the dyes used for fine fabrics and textile designs. (He devoted much of his labor to developing more lightfast blue and violet dyes.) This middle position between organic chemistry, manufacturing technology and consumer response brought basic color problems to Chevreul's attention, in particular the apparent shift in the depth of black fabric depending on the colors surrounding it. "In the case where the eye sees at the same time two contiguous colors, they will appear as dissimilar as possible, both in their optical composition [hue] and in the height of their tone [mixture with white or black]." He distinguished three situations in which this color contrast could be observed: simultaneous contrast, which appears in two colors viewed side by side (which was familiar to painters since the Renaissance), successive contrast, more commonly called negative afterimages (which had been studied since the mid 18th century), and mixed contrast, which appears in two colors viewed one after another (that is, the second color is mixed with the negative afterimage of the first color)  an effect Chreveul observed in the distorted color judgments of textile buyers who examined first many fabrics of one color, then of another. Chevreul claimed to predict the visual effect of simultaneous contrast across all these situations with a single rule: if two color areas are seen close together in space or time, each will shift in hue and value as if the visual complementary color of the neighboring or preceding color were mixed with it. Thus, if a dark red and a light yellow are seen side by side, the red will shift as if mixed with the visual complement of light yellow (dark blue violet), while the yellow will shift as if mixed with the complement of the dark red (light blue green): the red will appear shifted toward violet, and the yellow toward green. (Similar shifts appear if either color is seen after the other.) At the same time, dull or near neutral colors will make saturated colors more intense, though Chevreul was not clear about this effect. Chevreul developed a hemispherical color model to explain and predict these various contrast effects. He adapted Newton's hue circle by locating the six subtractive "primary" (red, yellow and blue) and secondary (orange, green and violet) hues at equal sixths around the circumference, added the tertiaries (violet red, orange red, orange yellow, yellow green, green blue and blue violet) in between, just as Moses Harris had done. Finally Chevreul divided each twelfth into six intervals, for 72 hue increments in all. The mixing complement of each hue was placed directly opposite it on the hue circle. 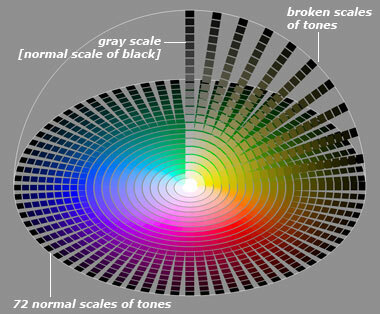 Each hue increment was represented by a normal scale of tones (image, right) which presented the most saturated pigment (or pigment mixture) for that hue in a series of 22 value steps, from pure white at step 0 (the bottom of the scale, placed at the center of the hue circle) to pure black at step 21 step (at the circumference of the hue circle). The same numerical step of the normal scales was intended to have the same height (lightness) across all hues. This meant that the location of the "pure" hue within each scale depended on its lightness: light hues such as yellow would be closer to white, dark hues such as blue would be closer to black. All steps above the pure color were mixtures of the pigment with black only, all steps below it with white only. To transform the hue circle of spokelike normal tone scales into a hemispherical color model, Chevreul specified that a vertical axis be constructed at the center of the hue circle. This axis would be the "normal scale of tones" for black  that is, a 22 step gray scale, with white at the bottom step 0 and black at the top step 21. Then each step of this normal black scale would be mixed with the corresponding step of the normal tone scale for each hue, in 9 equal visual steps according to the visual mixture ratios 9:1, 8:2, ... 2:8 and 1:9. These 9 new scales would be arrayed as a "fan" rising above the normal tone scale (image, below). 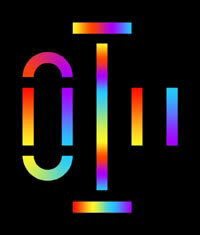 When this operation was completed for all 72 normal tone hue scales, the result would be a color hemisphere, cloaked in black with white at the center. Although (to my knowledge) no physical model of Chevreul's color hemisphere was built in his lifetime, editions of Chevreul's book included illustrations of the hue circle in large format, sumptuous lithograph color plates that were printing achievements for the time. This makes Chevreul's model one of the first mixture color models, because his color system had to be translated into explicit ink recipes, or printing procedures, in order to be reproduced. a "normal scale of tones"
"Of colors of equal lightness, that will look brightest which is against the darkest background, and black will display itself at its darkest against a background of greatest whiteness. And red will look most fierce against the yellowest background, as do all colors surrounded by their directly contrary color." And Chevreul certainly knew Aristotle's comments on the visual mixtures of different colored yarns. In any case, he asserted priority by exploring these historical topics with thorough experimentation. Chevreul's book is a laborious survey of color effects using colored papers, yarns, glasses and afterimages; of colors placed against one another or in contrast with white, gray or black; of colors in printed or paper designs, in paintings, in clothing and textiles; and of the effects of different hues and intensities of illumination, including light through stained glass windows.  harmony of contrast of colors, produced by the contrast between complementary or near complementary hues, sometimes augmented by a contrast in tone  a contrast which Chevreul called "superior to every other" when the colors are of similar tones. These harmonies or contrasts could be enhanced by combining with white or black backgrounds or borders, especially when the colors were "luminous" (saturated or light valued). Chevreul's prescriptions come at the end of the book, however, and few artists read that far because of the exhaustive and complex description of color research that preceeded it. His reputed wide influence on 19th century artists was actually channeled through the concise summary of Chevreul's work offered in the Grammar of the Graphic Arts (1867) by the French art critic Charles Blanc (1813-1882). Inconsistent terminology and Chevreul's faulty understanding of color vision make many parts of the text either confusing or inaccurate. Chevreul claims, for example, that the "primary" colors are created by "pure" red, yellow and blue light, and that contiguous colors "take away colored rays" from each other. We now know that paint colors have little in common with light "colors", that the subtractive "primaries" must reflect a wide spectral range to be effective and are therefore not "pure" (yellow for example is a mixture of "red" and "green" light), and that the color shifts Chevreul described occur not in the light but entirely in the mind. Artists can benefit from repeating Chevreul's color demonstrations in order to see the color effects for themselves  a study that is more compelling than just reading the book. Faber Birren's annotations at the back, read straight through, provide a reasonable outline of Chevreul's main points, although in the details Birren's comments are sometimes weirdly inaccurate. The plodding translation doesn't help, as it reproduces the 19th century French vocabulary and syntax almost word for word: the result isn't French but it's not really English either. Modern Chomatics by Ogden Rood  Although Michel-Eugène Chevreul usually gets the credit for laying out principles of complementary color contrast in a way that 19th century artists could use in their work, the real story is different. Many decades before Chevreul published his book, painters were already consciously using complementary color contrasts, and the German painter Philipp Otto Runge was really the first to publish (in 1810) a comprehensive mixture color model designed to solve artistic problems. Though Chevreul's book made a splash in scientific circles, most 19th century French artists learned his color recommendations in simplified form from secondary sources such as Grammaire des arts du dessin (1867) by Charles Blanc, or L'Optique et les arts (1869) by Auguste Laugel. Toward the end of the 19th century, artists acquired more advanced color concepts from several less technical publications based on the magisterial Handbook of Physiological Optics (1867) by the German physicist and physiologist Hermann von Helmholtz. One of the most popular and influential of these was Modern Chromatics (1879), written by the Columbia College (New York) physicist, Ogden Nicholas Rood (1831-1902). The impact of scientific concepts on artists' use of color was especially strong in the late 19th century, and Rood was able to join the worlds of laboratory and studio thanks to his talents as an accomplished scientist, university professor and amateur painter. He was expert in the contemporary color research of physicists James Clerk Maxwell and von Helmholtz, having studied physics for four years in Germany. He brought an elegant clarity to his descriptions of light and the tools needed to conduct color research (including use of a color top to demonstrate additive color mixtures with colored paper disks). His book describes the results of various color experiments in a way that builds the reader's comprehension step by step, and addresses many of the color design questions that artists of the time would want answered. Rood's book was translated into German in 1880 and French in 1881, and was reprinted as late as 1916, almost 40 years after its publication. It was especially popular with artists toward the end of the 19th century  the Neo-Impressionist painters Georges Seurat and Paul Signac both owned a copy  and it is still a gem worth reading. Rood was perhaps the first author writing for a general audience to explain clearly and in detail the differences between additive color mixing (of light, simulated with a color top) and subtractive color mixing (of paints or dyes). He exhaustively described the prismatic spectrum, and the three colormaking attributes of hue, saturation and value. (The original research for the Munsell color system relied heavily on Rood's concepts and research expertise.) He also refined Maxwell's positioning of common artists' pigments within Maxwell's color mixing triangle, laying the foundation for all subsequent mixing color wheels. The attention to experimental methods and empirical detail in Rood's book is especially rewarding; for example, it's the only place where I've encountered a description of the different colors in the natural spectrum (yellow is the most luminous color, but not the most saturated). All the fundamentals of color presented here are still accurate, and described so clearly that you seem to be conducting the color experiments yourself. These may seem like trivial details, but color is mostly in the details. Rood's research tools were primitive by today's standards, and his recommendations on the artistic use of color may seem out of date. But the intellectual clarity and inquisitive spirit of the book are well worth encountering for yourself. The facsimile text is prefaced by a historical overview of "color theory" and 19th century painting practices written by Rood's son (a chemist), with a commentary on Rood's text by Faber Birren and Ralph Evans, who explain details of Rood's research methods and clarify some outdated scientific assumptions. The Birren/Evans edition of the book is currently out of print, but fairly easy to acquire from online used booksellers. Exploring Color (revised edition) by Nita Leland  One of the most practical and attractively designed books on color and paint mixing. Leland has been teaching color for over twenty years and this is the culmination of her workshop experiments and experience. Art is often a victim of theory, but not in Leland's approach. For her, color is never far from an actual painting. She begins by asking you to paint a quartet of seasonal landscapes to find out how you are using color now, then returns to landscapes near the end of the book to compare the effects of the different palettes she has discussed. This implies that the palette defines a painting more than any of the techniques used to mix or apply the paint. Her focus is on the physical qualities of paints (rather than paints as the elements of an abstract color system), and this approach shines through her many teaching examples. She presents mixing triads consisting of staining, nonstaining and opaque pigments  and explains how these attributes affect the finished colors in a painting. She tells you how to do your own paint tests, color swatches and paint wheels, and insists you go through the work of learning the physical quality of your paints and connecting these back to colormaking attributes of hue, chroma (intensity) and value. "Color theory" is kept to a minimum  primary, secondary, and tertiary color wheels are all she covers. She guides the reader to evaluate color appearance, transparency and staining as the major points of difference between paints. She doesn't want you to memorize rules or systems but to discover through your own experience the paint choices that work best for you, and the unique effects that different paints can create. The small amount of theory she does introduce is usually presented clearly and accurately, and she keeps theory tied to mixing tasks. She is also one of the few artists I've encountered who emphasizes the difference between pigments, "colors" and paints, which liberates you forever from fuzzy thinking about your paint selections. My one disappointment: her reliance on the split "primary" palette, which seems to me much less effective as a palette design or a general color learning framework than the secondary palette. Because Leland thinks of colors as physical substances with unique attributes, this book is most valuable if you work through it page by page, mixing with real paints as you go, so that you can actually experience these amazing substances with your hands and eyes. I feel Leland wants to introduce you to the self teaching artistic process of experimentation with the basic materials of color. She really does focus on exploring color, which is ultimately the best way to develop a confident understanding of how paintings are made. Color Right From the Start by Hilary Page  This is conceptually the most ambitious book on color mixing, and probably the most suitable general book on color  from theory to practice  for the practical artist. Page opens with three chapters on light, color and sight, with topics ranging from the physics of color, human retinal cells and Newton's original color wheel to additive color mixing and complementary color contrast. Most of this discussion is clear and apt, though some of it veers into needless erudition: why can't we learn about color without quotes from Goethe? Oddly, Page does not touch on the basic rules of color perception or any of the modern color models, which together provide a comprehensive modern framework for explaining color vision. The next two sections firmly contrast paints as colors or pigments. Colors are introduced through the project of making what I call a paint wheel (to distinguish it from the perceptual or conceptual color wheels). This section includes an excellent explanation of color mixing and optical color change. Pigments are introduced through the project of making test paint swatches, followed by a discussion of paint nomenclature and a review of pigment histories and pigment types. The remaining sections devote four chapters to different color categories (earth, yellow and orange; red; rose and violet; blue and green). Each section includes a review of the major pigments in each color category (with test swatches to show the paint's hue and texture), a demonstration painting that showcases the color's unique attributes or mixing behavior, and a general issue that the color typifies well: lightfastness for rose and violet, granular pigments for blue, reflected colors for yellow. Published in 1994, the text is now inaccurate regarding some paints ("winsor red" is no longer made with a naphthol pigment), but a copy of Page's excellent watercolor paint guide and her update additions to it will remedy that. This is a book every watercolor artist should study for its accuracy, breadth, and practical usefulness. Color Choices by Stephen Quiller  Far and away the best book to explain and use a mixing color wheel. Most discussions of color stay at the level of generic color labels: "yellow and blue make green." Quiller has made the extra effort to precisely position over three dozen pigments (such as hansa yellow or ultramarine blue) on his mixing color wheel, then explains how to use the wheel to select an abstract color scheme (complementary, analogous, triadic, etc.) for your work. In this way he brings together the color wheel, paint selection and color design as a unified approach to color. Quiller says he originally used the Dudeen subtractive mixing triangle but changed it to color wheel because students found that easier to use. Following Sloan, he painstakingly positioned his paint samples through the method of complementary mixing: pigments that are exactly opposite of each other on the color wheel (mixing complementaries, such as ultramarine and raw umber) should mix to a neutral gray or black. A few dull or very dark colors, such as burnt sienna, are placed inside the wheel to suggest the effect that low chroma has on their mixing behavior, but in general there are no distinctions among paints in terms of their value, chroma or mixing behavior  staining or nonstaining, transparent or opaque  as in Jim Kosvanec's approach. Quiller says his color wheel is based on the "true complements," but (as I explain elsewhere) identifying complementary colors through paint mixing, as Quiller does, is a completely unreliable method for defining a color wheel. And he seems unaware that Sloan's mixing triangle, like my artist's color wheel, is based on additive paint mixing. Quiller's approach implies that the mixing complements define unique hue complements  for example, all the paints that mix to gray with viridian are the same middle red hue. In fact, each blue or green paint may have several mixing complements, and these may be quite different in hue! The problem is compounded because Quiller offers his wheel to watercolorists and oil painters alike, even though subtractive color mixing behaves differently in these different media. Not surprisingly, with all the mixing practice he's had, Quiller gives a lucid presentation of color mixing procedures and the best choice of colors for different color schemes. Then he stretches the reader's ambitions with wide ranging chapters that advocate going beyond a structured approach to color, modifying colors with different methods of paint application (such as glazing), and finding your own artistic vision. The final section reviews the palettes of some of the great colorist painters  an inspiring conclusion to a masterful book. A minor flaw is Quiller's approach to mixing colors: he uses four paints, two to mix each complement of the desired mixed hue, which is then found along the mixing line between the two mixtures. This approach may have a didactic purpose, but as I explain in the page on color mixing, you can get equally effective results with at most only three paints, and often only two. Quiller's subsequent book, Painter's Guide to Color, is both a new and old revision of Color Choices. New, in the expanded information on color schemes and color mixing (including Quiller's latest color mixing wheel, the important concepts "color families" and "mother color," and the geometrical method for planning color mixtures); old, in the information on color value and saturation (the use of neutral colors to showcase saturated accents)  themes handled better, I think, by Jeanne Dobie. The few pages on locating color mixtures on the color wheel are disappointing, since Quiller doles out every mixing combination of two paints for all the colors on his palette, rather than teaching the artist how to swim on any palette with improvised color mixing. And Quiller stops there  even though the intuitively sensible geometrical mixing method, examined carefully, reveals important systematic biases in the color wheel. Quiller, far from delving these complexities, admits to having discovered the geometrical method only "a few years ago"  though Isaac Newton first described it in 1704! In other sections  the chapter on color families, the visually interesting but impractical paint wheels based on the twelve major color notes, mixing "grays" and "near grays"  Quiller seems content to present all possible mechanical variations on some simple principle, without showing how to apply the principle in design contexts. There's an odd sense that he wants to show us all the mixing combinations, because we won't try to do them on our own. Some changes struck me as bad decisions. Quiller recommends a 28 paint palette that almost guarantees a student will never get color mixing under control. (Something pared down, like the secondary palette, is a better starting point.) The admirable sections in Color Choices on moving beyond structured colored approaches and finding your own vision have been deleted. In their place, a new section on "color families" catalogs the color wheel locations of a dozen or more hues in each sextant of the color wheel. Each color is tagged with dubious "meaning" labels: a color close to quinacridone violet is said to represent suffer, liver, cranberry, courage, embarrassment, vanity, barbaric, sadness, vulnerable, twilight, murder ... barbaric cranberries? embarrassed courage? Twelve pages later, we've only concluded that color can't be reduced to verbal recipes. These throwbacks to the worst lapses in Faber Birren's color writings, along with Quiller's mechanical variations on simple mixing ideas, make this book much less satisfactory than Color Choices, which is fortunately still available from online book retailers and definitely worth careful study. Transparent Watercolor Wheel by Jim Kosvanec  A "color mixing" book that offers both a lot of detailed practical advice and a conceptual color mixing system. The system amplifies the traditional color wheel by categorizing paints into five groups: nonstaining and transparent, nonstaining and semitransparent, staining and transparent, semiopaque or opaque, and semiopaque containing white or black. Through this basic scheme, Kosvanec aims to teach the effects of mixing paints as substances rather than as abstract hues  just the opposite of the approach taken by Stephen Quiller. The really valuable part of this book is the practical advice, which is rich with insights born of painting experience. Kosvanec discusses the differences among watercolor papers, how to stretch papers or mix paints, and describes simple "paint tube tricks" for salvaging excess paint or opening stuck tubes. He demonstrates a method for judging the most "luminous" concentration of paint by the beading of the watery mixture on a palette (unfortunately, a method that is often inaccurate). He includes a fine gallery of contemporary watercolorists and a discussion of their paint choices, step by step examples of how to build a painting, and a chapter on analyzing completed paintings. And throughout the book, Kosvanec repeatedly stresses the importance of paint lightfastness. This book guided my early steps in watercolor, and to this day I feel that Kosvanec's emphasis on materials and techniques, and the material qualities of paints, is a deep artistic wisdom. Because Kosvanec's mixing system is also based on "colors," it gets muddled by association. For example, he says "permanent rose" is a transparent and nonstaining paint, but those are characteristics that depend on the brand of "permanent rose" paint you use. (In any case, I have never come across a "permanent rose" paint that wasn't staining!) The distinction between "staining" and "nonstaining" must be put in context, because manufacturers change their vehicle formulations and pigment selections over time, and "staining" also depends on the external sizing of the paper used  some papers let you to lift a "staining" phthalo pigment easily, while others soak it up like a sponge. Kosvanec also seems to equate staining with tinting strength, which are not the same thing: staining is an effect on paper (and is relative to which paper you use), tinting is an effect in mixtures (and is constant for each paint). He claims that opaque paints are "sullied" or "made muddy" by "staining" paints, but he apparently means that the mixtures are "less luminous"  that is, darker in value or less intense. Why are dark, muted mixtures a bad thing? The kicker is that Kosvanec apparently knows his conceptual mixing system is too simplistic. He mentions that staining paints can work well with other paints  if they are mixed at the right dilution with water, and applied without fussing or reworking. He also mentions that "most artists minimize opacity by skillfully laying down a passage and leaving it alone," but says nothing more about painting technique as an important aspect of his paint mixing system. I regretted Kosvanec did not offer more detailed guidance or information on these topics, especially given the alertness to materials and processes that shines through the rest of the book. This is not primarily an instructional text, as there are no graded lessons and few demonstration paintings. Despite its flaws, it is a great reference for many painting skills and technical problems that are either too detailed, too practical or too high level for other books to mention. Because it is now several years old yet has remained a best seller the whole time, I strongly hope Watson-Guptill decides to print a second edition, with color index information instead of marketing names in an updated "color" guide, and a better discussion of optimal paint dilution and color application techiques. As it stands, you should take to heart the many practical insights Kosvanec offers, while taking his guide to "colors," and his elaborate color mixing system, with a transparent and nonstaining grain of salt. Blue and Yellow Don't Make Green (Second Edition) by Michael Wilcox  Another characteristically overwrought School of Colour product, the cover illustration shows an 18th century color wheel going up in flames ... burn, baby, burn! The publisher's blurb explains: "Wilcox found that grade school formulas for mixing colors don't work. Tossing out tradition, Wilcox effectively transforms color mixing from a process of chance to one of choice." The reality is a little less dramatic. Wilcox builds his color mixing system on a color bias wheel that incorporates color mixing ideas found as far back as Chevreul's The Principles of Color Harmony and Contrast, published in 1839. (So much for tossing out tradition!) I quote and critique those ideas in the section on the split "primary" palette. Of course, Wilcox's system is still based on a color wheel model of color mixing  just in a radically simplified form. Wilcox doesn't torch the color wheel, he dumbs it down to a color daisy. Color mixing is transformed "from a process of chance to one of choice" by limiting the mixtures to combinations of two paints from a palette of six. (So much for grade school formulas!) The full range of hues between every pair of paints, from masstone through tints, is handsomely reproduced in full page color spreads  although these are computer generated colors, not photographs of actual paint swatches. The Wilcox value proposition is basically the same as a housepaint retailer: choose a color swatch and I will tell you the paints to mix and the proportions to use to get that color. Wilcox says his readers should understand why paint mixtures create different colors, so he spends 34 pages discussing the "science" of color mixing as "colored light" bouncing around layers of pigment particles. This is where many factual errors appear. For example, he teaches the artist to think of an orange yellow or green yellow paint as a mixture of "orange" and "yellow" or "green" and "yellow" light. But because the color is not in the light, and additive light mixtures are very different from subtractive paint mixtures, Wilcox misrepresents the patterns of "colored light" actually reflected from some paints, for example the yellow shown below. Why would Wilcox describe the light mixture reflected from yellow paint ("red" and "green") as if it were a paint mixture (yellow mixed with some green)? Because he is quoting 18th century paint mixing concepts. That is, he teaches the artist to assume that paint color equals light color, then to locate paint color in terms of the traditional six secondary colors (the six colored bars in the diagram). These six hues are the cornerstones of the 18th century complementary color calculus quoted by J.W. von Goethe  yellow cancels violet, orange cancels blue, red cancels green, in each case resulting in a gray mixture  that the artist can use to predict whether paint mixtures will be dull or intense. It works like this: if orange yellow is mixed with green blue, the orange cancels the blue to produce gray, and this gray dulls the mixture of green and yellow that remains. Unfortunately most of this is incorrect as a description of subtractive color mixing (paint mixtures end up much darker than this calculus implies they should be), and it ignores a much simpler rule for predicting intense or dull paint mixtures: the farther apart two paints are on a color circle, the duller their mixture will be. The whole complementary color calculus, and the scheme of splitting "primary" colors into "warm" and "cool" pairs, are needless complications devised to salvage the 18th century conception of "primary" colors. Worse, the School of Colour treats paints as "colors," when they are in fact primarily pigments. The problem of substance uncertainty means that paints with the same apparent color can produce very different color mixtures; it is this uncertainty that most beginning painters find so confusing. Thus, phthalo green is the same "color" as viridian, but the two pigments have completely different physical attributes: they granulate and backrun differently, they stain papers and lift under rubbing differently, they mix, wash, stipple, glaze, create blacks or greens differently, they have very different tinting strengths and change in hue and chroma differently as they are diluted with water or white paint. All these physical attributes of the paints are lost to the eyes and hands of people trained to think in terms of colors. In this revised edition, Wilcox tries to address substance uncertainty by choosing his six "principle" (he means principal) colors to include three opaque paints (cadmium scarlet, cerulean blue and cadmium yellow) and three transparent paints (quinacridone violet [he apparently means PV19 rose], ultramarine blue and hansa yellow light). He contrasts the color quality of mixed purples obtained by using his two blue and two magenta paints in different combinations  two dull pigments, two intense pigments, or a dull and intense pigment  to emphasize the effects of using transparent or dull paints. After ringing similar changes across greens and oranges, he tackles the three paint mixtures that produce "colored grays." These pages are a noticeable improvement over the previous edition, which glossed over the nuances possible with three paint mixtures and largely ignored the color variety produced by using different paint combinations. Other new sections of the book add useful pigments (earth pigments and the phthalocyanines) to create an expanded palette, argue sensibly in favor of using white paint in watercolors, and discuss issues with the use of carbon pigments. The new edition concludes with a brief library of paint reflectance curves, and here an alert reader will realize that these contradict many of Wilcox's earlier color generalizations. Wilcox tries to reconcile these curves with his simplified mixing scheme by saying "my diagrams of earlier pages are meant to illustrate the practical applications of reflected colors, rather than the scientific." Indeed  but then why spend 34 pages on an admittedly incorrect description of light and color, presented as a "scientific" explanation? The bottom line is that the changes in this revised edition are in the right direction, and I feel many novice painters will benefit from Wilcox's tutorial, provided they do not absorb the errors and distortions detailed above. I'd especially urge readers actually to work through the mixing exercises Wilcox describes: the only way to master paint mixing is to do it often. But Wilcox seems aware that this is an unrealistic expectation and provides computer generated mixing illustrations in high quality color printing as a substitute. The real point of mixing exercises is that, in watercolors especially, everything depends on the paints, not on the color abstractions. The books by Hilary Page, Nita Leland or Jim Kosvanec offer less dogmatic approaches to color mixing, with more focus on the unique behavior of paints, that can help you go beyond the mixing generalities taught by the School of Colour. Color Theory Made Easy by Jim Ames  There is a big literature out there by "color theorists"  Faber Birren, Johannes Itten  which lurks in my memory as lots of colored squares inside colored squares, endless gassing on about "the meaning of colors," quotes from Goethe, all that. Ames takes a more practical approach to color, working hard to bring everything down to how paintings get made. Unfortunately, Ames starts out with a bogus theory of color perception  and by looking at the world through a prism, just as Goethe did. (This has to be taught as a new rule to art students: study color like Goethe, get color wrong like Goethe.) Ames gets some of the basics right  for example, that color is "in the mind," not "in the light" (a point Michael Wilcox can't get clear on). But there is zero scientific evidence that yellow, magenta and cyan are "psychological" or "universal" primary colors, or that vision operates by inhibiting the excitation of "color centers" that exclusively process those hues. Ames has made up this theory all on his own, and fallen into a deep hole as a result. (In fact, the idea that one part of the brain "inhibits" another is a relic of Freudian era pseudoneuroscience. I've posted a better documented overview of color vision, which barely touches on the complexities.) Yellow, magenta and cyan are the most effective "primaries" in subtractive color mixing simply because they are the paint colors that most strongly stimulate the L, M and S receptor cells in the human retina; they have no special status in the brain. If you tear out those pseudoscientific pages, the rest of the book is worth study. Ames does a fine job of locating specific pigments around the color wheel, compares the attributes of different brands (some of this information is outdated, because paint brands change their pigment ingredients), and exhibits the hues that result from the various paint mixtures. The printing and reproductions are top notch (Ames clearly knows his color printing technology), and he shows us real paint mixtures, not Wilcox's computer generated imitations, so the colors come through very well. The third section, "Practical Applications," shows how to apply the mixing of hues, tints and shades to the basic problems of painting objects or landscapes. Ames explains how to mix grays from the three primary colors, using complementary colors to mix tones (dull versions of a hue) or shades (darker versions of a hue), and using these mixtures to render atmospheric perspective and shadows. He explains color relativity, modeling objects by shifting color warmth, and mixing flesh tones. All this advice is compact and accurate, making the book a useful reference. Ames regrettably talks about paints as if they should be measured against his psychological color theory. (He also thinks they have to be judged against every known health concern, which really drives me up the wall.) I don't empathize with his anguished search for the "perfect" yellow, magenta or cyan paint, most of all because color is a subjective, individually variable inner experience, not an objective quality of gummy pastes. Primary colors simply don't exist, and color information should be useful to artists, not scientists. Artists learn the unique attributes of the materials available to them, so they can use materials skillfully to realize their artistic ideas. The "perfection" of esthetic or scientific systems is always imposed after the fact. Zoltan Szabo's Color-by-Color Guide to Watercolor by Zoltan Szabo  Here is a color book with the focus squarely on paints. Szabo selects forty individual paints, each specified by manufacturer, then presents a variety of palettes of four to six paints organized around a dominant or "key" color. He then uses each palette in a demonstration painting that highlights the key color's principal effects on the mood or atmosphere of the painting: a misty seascape for quinacridone magenta, shaded snowbanks for manganese blue, fall leaves for cadmium orange. The paintings themselves are simple and striking  perfect for a quick attempt on a small watercolor block  so everything is arranged for a convenient hour of playing around with paints. Each lesson starts with a reference photo of a landscape subject, and progresses through three demonstration illustrations that show (and explain in detailed captions) how the paints are mixed and handled in washes, glazes, lifts, scraping, negative painting, and other basic watercolor techniques. Szabo also introduces the effects unique to the four different ways of creating color mixtures: glazing one paint over another, charging wet areas with two or more pure colors, using small brushstrokes that are visually mixed by the viewer's eye, or simply mixing the paints on the palette. I glazed the shaded side of the buildings with a [MaimeriBlu] Permanent Violet Bluish and Blockx Green mix, and charged it with [Rembrandt] Quinacridone Rose. I painted the big tree with a wash of [Blockx] Gamboge Yellow, Permanent Violet Bluish, Quinacridone Rose and a touch of Blockx Green. I glazed the shaded side of the buildings with a mix of dioxazine violet (PV23) and phthalo green (PG7), and charged it with quinacridone rose (PV19). I painted the big tree with a wash of Blockx "gamboge yellow" (a convenience mixture of PY1 and the impermanent pigment PR3), dioxazine violet, quinacridone rose and a touch of phthalo green. Better? Obviously, it would be easier on the reader if the inserted pigment color index information were gathered in a single page reference table at the beginning of the book, where Szabo could recommended a paint brand for each "color"; the text would refer to paints by their generic pigment names (phthalo green, dioxazine violet, etc.). The point is that now you know exactly what Szabo intended to tell you, even if the manufacturers changed or discontinued paints after the book was published: you can find a replacement dioxazine violet or phthalo green from another manufacturer, if you prefer; you can replace those pigments with the less staining but visually similar ultramarine violet or viridian, if you prefer; you can even replace less permanent paint choices like the "gamboge" mixture with a more lightfast mixture of naphthol vermilion and hansa yellow, if you prefer. In short, you're liberated from the tyranny of cheesy paint "color" names, which are only marketing gimmicks anyway. You finally understand which pigments you are using, and why. To be most useful, Szabo's paintings should be explored with a more theoretical color book, such as those reviewed above by Leland or Page, as a companion. In this way the student can use Szabo's reference photos to introduce color contrasts or perspective effects of her own. The editors have also let slip some inconsistencies in paint labeling, but these are quibbles beside the book's merits. Szabo invites us simply to play with watercolors because there is always so much about them yet to discover. Color In Contemporary Painting by Charles LeClair  This is not really a book on watercolor painting (for that, see LeClair's The Art of Watercolor Painting) or on "color theory," but a book that uses color and painting materials as a window onto American paintings of the 1980's. LeClair uses the format of a slide show art lecture to present over 150 works by 70 artists, embracing both the new themes of the '80s and artists (such as Rivers, Albers and Mitchell) in the active tradition. LeClair's selection is a very good overview of the decade's art ideas: both eclectic and appreciative of the variety he has found. He does a good job of presenting art concepts, including a stripped down "color theory," in simple and natural terms. The hideous jargon of the postmodern academic art industry is disparaged by explicit omission. LeClair focuses instead on the craft aspect of painting  including a color test sheet to match one of Osborne's limpid watercolors, or two stages of a painting by Galuszka. His comments are alert and directive, pointing to aspects of the work we can actually see (rather than infer from critical cleverness), and tying what we see back to the processes of brush and paint that created the image. I don't much like LeClair's intellectual style: the idea of "color games," picked up from James McNeill Whistler, was a precious, 1980's academic conceit that has already gone out of fashion  yet again. But LeClair has admirable knowledge and real passion for art. Most watercolorists will find it is an imaginative leap to connect these various trends and techniques to their own work, but it's a leap that some will find stimulating to make. Time is sometimes harsh to artistic reputations. Among the unexpected insights I took away from LeClair's survey were the occasional encounters with empty gesture and meaningless art rhetoric  both in the paintings themselves and in LeClair's argument for their merits  that time has shown were not as bold or innovative as they seemed just a few decades ago. Color: A Course in Mastering the Art of Mixing Colors by Betty Edwards  I have saved the least for last. This recent book is yet another contribution to the wrong kind of color literature  the "color theory" color literature. Larded with color misconceptions, color falsehoods, handwaving about "color experts" and a ripe selection of nonsense color platitudes from the likes of Johannes Itten and Johann Goethe, the most remarkable lesson in this book is that many artists simply cannot accept that 18th century "color theory" is completely useless and must be discarded. Given her justified reputation as a drawing teacher, it is surprising that Edwards merely recycles the "color theory" inherited from the 18th century (primary colors, complementary color contrast) and mummified as elaborate dogma in the 19th century ("paints don't mix all colors because they are not pure enough", and the don't mix "mud" prohibition against near neutral tones). Indeed, Edwards parrots these ideas and other ideas secondhand, in dribs and drabs, with no real insight into what she is saying. Consider how she uses "technical" words and concepts. She continually refers to "spectrum" colors of paint (for example, "you must add alizarin crimson to cobalt violet to achieve a clear spectrum red violet"), but what does "spectrum" mean, exactly? It's a term she never defines. Obviously paints cannot be as saturated ("clear"?) as spectral hues, and all hues, saturated and dull, can be identified with a matching or complementary spectral wavelength (the dominant wavelength of the color). She incoherently declares that "cadmium yellow pale is very close to true spectrum yellow," when all yellow hues appear in the spectrum, each just as true and pure as any other. And red violet is not a hue that appears in the spectrum at all: it is an extraspectral mixture of "red" and "blue violet" light, identified by its complementary spectral wavelength of green! She confusingly refers to highly saturated colors of paint as intense, or maybe bright, or clear, or pure  she can't decide which. And she calls paints "pigments" simply for style points. (When she shops for paints, Edwards says "I want to buy pigments made with lightfast pigments!") Page after page, Edwards falls into the disreputable habit of misusing technical words (spectrum) to sound like an expert, and misusing judgmental words (true, pure) to sound like a connoisseur. Since Edwards still holds misconceptions from the 18th century, she completely misunderstands how paint mixing works. For example, she claims that cadmium red cannot mix well with cobalt violet because "the slightly orange color of the red, when mixed with cobalt violet, produces a dull and muddy red-violet." In fact, it is the cadmium's lack of reflectance in the "blue" wavelengths that causes the dull mixtures between a red and violet paint, because all violet colors reflect both "red" and "blue" light, and the color of a subtractive mixture only consists of the light reflected by both paints. Substitute quinacridone red (which reflects "blue" light) for cadmium red, and the mixture is more saturated. The presence of orange has nothing to do with it. Those style criticisms would amount to carping if the book clarified the basic mixing method, saturation costs, substance uncertainty and other practical, concrete problems. But it doesn't. The introductory color lessons ask the student to make little wheels of color or value range and then, when the little wheels are completed, to copy wallpaper. No, that's not a metaphor or insult: Edwards explains how to tear a corner from a piece of wallpaper, paste it to the corner of a watercolor paper, then copy the design while inverting or shifting the color scheme. Compare these lifeless exercises with, for example, the stimulating course of study recommended in David Dewey's watercolor book, where hand and eye are linked from the very beginning. The paste crown jewel of Edwards's color wisdom is her scheme for "color harmony". Each painting must contain a balanced selection of primary colors that are balanced within themselves on lightness and chroma. As we are in the realm of mummified color theory, "balance" is specified in terms of balanced proportions of the traditional complementary color contrasts (yellow+purple, orange+blue, red+green). This is another color bromide. The 18th century English naturalist Erasmus Darwin observed that "When the prismatic colours are painted on a wheel, they appear white as they revolve" (1794). So Victorian art theorists deduced  because complementary colors were by definition harmonious, and harmonious complementary colors mix a gray paint  that a harmonious painting, spun on a turntable, would blur into a gray disc! The irony is that Edwards introduces as a principle of color harmony what she disparages as "mud" in color mixing. Indeed, this book has a dispiriting, reductive approach that amounts to teaching the deaf to sing. Strip away all the pseudosavant references to color theorists and quotations from great artists and "color experts", and you're left with a dreary cookbook. Paint something simple, like a vase with flowers. Hold up you metric wheels to judge colors. Adjust colors using your wallpaper painting skills. Make paintings by blocking in colors, then adjusting colors. Stand back, squint, and "change whatever color doesn't look right." Add colors that are missing and vary colors that are too similar. Use complementary colors. And always, avoid mud. Had enough of that? Well, too bad. Get a new sheet of paper, a new simple subject, and repeat. stephanie knows more about color harmony than betty does!